One of the challenges I enjoy most about modern wedding photography is trying to find a unique angle, or have a different take on an otherwise popular photo. When wedding photographers only had the option of using film for their work, there were far fewer photographers competing for the same amount of work as there is today. Wedding photography was the domain of the professional, and for that reason there wasn't the choice of wedding photographer available back then as there is today. With modern digital cameras becoming more and more capable and cheaper by the day, an ever growing number of amateur photographers are buying DSLR cameras and attempting to photograph weddings, with various degrees of success. There is a danger that wedding photography will stagnate, with hundreds of people taking the same photos in the same location. Because of this, I'm always looking to get a different photo to anyone else. I like to think that one of my clients can have a look on google images for photos of their wedding venue, and not see a single other image like the ones I have delivered. The bride having her dress done up is one such photo where it's easy, if you're not careful, to end up taking the same photo at every wedding you do - a photograph of the bride from the front, with her reaction visible for all to see, and a photo from the back, showing the dress being tied. Maybe a close up of the bridesmaids hands with the buttons done up, but that's often all you see. 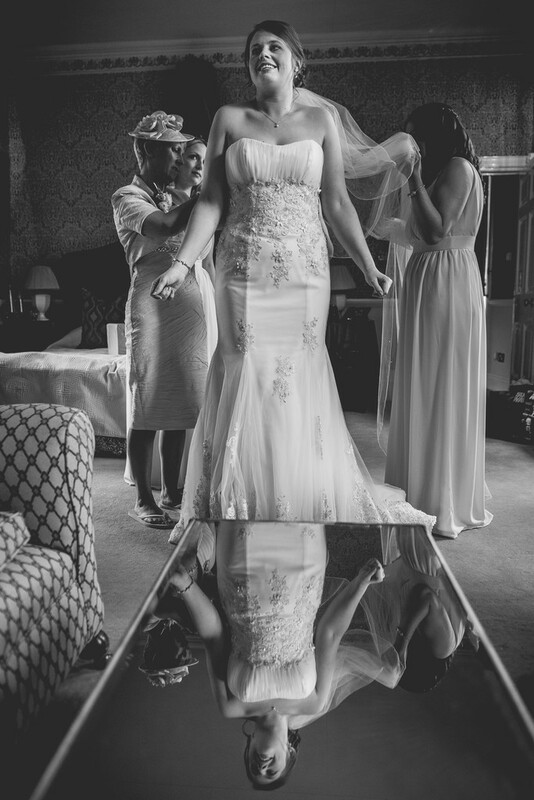 When Kirsty was getting ready in the bridal suite at Grafton Manor in Bromsgrove, she did so by a glass coffee table and two sofas that were in the room. The bridal suite at Grafton Manor is great as there are windows on either side of the room, giving plenty of natural, soft light. As I was moving around, trying to find a unique angle, I noticed that the surface of the coffee table was highly reflective, I changed to a wide angle lens, and got down on my knees in order to get the correct angle for this photo to work. Once I had my settings dialled in and the composition I wanted in the viewfinder, all I had to do was wait for the perfect pose to be struck. I pressed the shutter and stole a few moments of time, and Kirsty and Andy are left with a unique wedding photo that you won't see anywhere else.